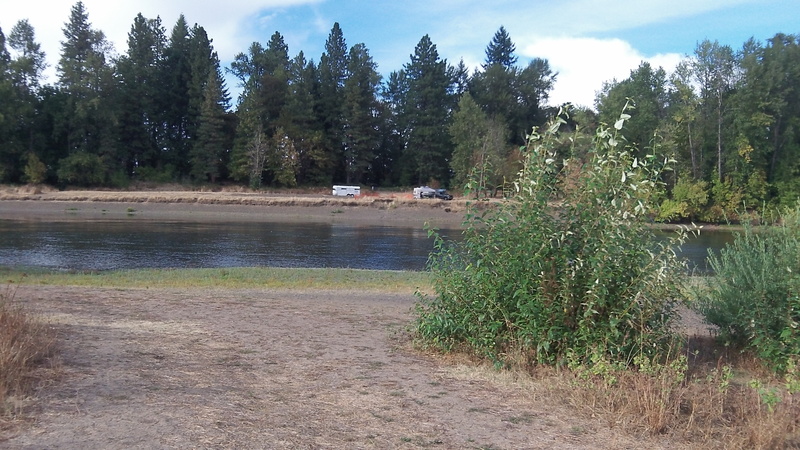 Despite the showers of the last few days, the Willamette River is still running very low after a summer of almost no rain. Nevertheless it’s a pretty substantial stream, as a stroll on the bank at Albany’s Bryant Park shows. I stopped at the park on a bike ride at the end of the day Friday. Checking online later, I see that the river has been running at barely above two feet on the Albany gauge. A very slight uptick was predicted for the next 24 hours, but beyond that the forecast is pretty steady at 2 feet or just above. At that level the flow is about 3,600 cubic feet per second. The Albany gauge, on the right bank just upstream of the Ellsworth Street bridge, is run by the U.S. Geological Survey, which sends someone by every few weeks, presumably to maintain it. Looking across the Willamette River from Bryant Park on the Friday before Labor Day. Hasso: interesting to note that both the Santiam and Willamette rivers are flow controlled by the US Army Corps of Engineers. The level of flow routinely set to maintain temperature and oxygen levels for the fish population. Normally, the Corps will increase flows right after the major recreation use of Labor Day. In part, this is done to empty the upstream reservoirs so they are ready to receive winter runoff to control localize flooding in the main rivers. If I recall correctly, the low flow in the Willamette, pre-dam days was sometimes under 1,000 cfs.